PHOTO BY MARK CHAMBERLIN Chicken Satay with peanut sauce. There are streets in Manhattan that have yet to be completely overtaken by chain restaurants, though they are further and fewer between than they were 10 years ago. These patches of resistance are little, rabbit-warren-like spaces, crammed with wood-grain Formica two-tops and tiny black chairs. They're dimly lit and decorated with tchotchkes reflecting the cuisine served: a skyline of Barcelona in a tapas joint, a small statue of Ganesh in an Indian buffet, a delicate arrangement of bamboo in a Chinese dim-sum house. Cooking scents perfume the air: cilantro, or onion, or curry, or schmaltz. In the winter, you avoid sitting by the windows because their poor weather stripping lets in the cold from outside. In the summer, you angle yourself toward the air conditioner precariously perched into the window above the main entrance. Outside, empty cardboard boxes are piled up by the curb, next to bulging Hefty bags filled with trash. Esan Thai on Park Avenue. Maybe it's not romantic, but it's the New York that I loved and lived in before moving to the Greater Rochester area 12 years ago. A born and bred downstater, I wasn't quite sure I'd be able to make the transition to Upstate New York life (nor the transition from single to married; from having no children to being a stepparent to two). On my first visit to the area, my then-fiancé — now husband — took me to Park Avenue for dinner. It was night: streetlights shone amber, and many of the storefronts twinkled with Christmas lights strung in the windows. The buildings, only a few stories tall, reminded me of the West Village. Cars were parked bumper to bumper on the streets. And just like home, there were a jangle of tiny, independently run restaurants, including Esan Thai, where we enjoyed dinner. Oddly, I hadn't been back to Esan until recently — though, obviously, it had left quite an impression. In some aspects, it still reminds me of those tiny, NYC restaurants. It is independently run, small, and a green-and-white awning shades its doorways. Inside, the walls are painted ocher and bear art that references Thailand, like the black tapestry woven with golden thread that depicts a royal riding party on elephants. A cavalcade of empty produce boxes are stacked up by the kitchen entrance and leafy plants decorate the dining room. The food is not as satisfying as I remember it. But the reason for that may lie in Esan's history. 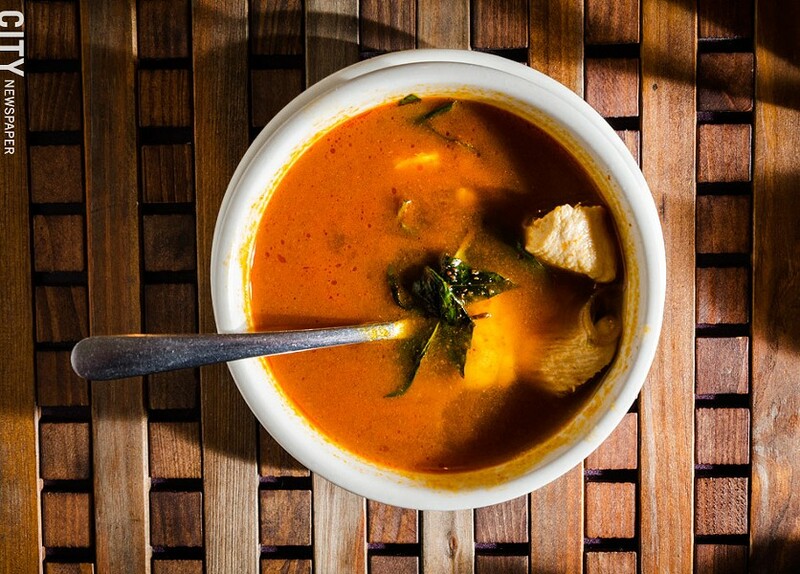 Tom Yum Chicken Soup from Esan Thai. By owner Bounkong Douangratdy's estimates, Esan has been in Rochester for nearly 20 years. That would make it one of the first, if not the first, Thai restaurants in the area. Back then "nobody knew about Thai food," says Douangratdy. The first stateside Thai restaurant had opened only 35 years earlier, and there wasn't a Food Network or Eater.com to make it a national trend. Our craving and demand for spicy foods wasn't well established, either. Today, ready-to-eat bowls of pad Thai are available at grocery stores, and recent news of a possible Sriracha shortage caused panic in foodie circles. That kind of culinary climate simply didn't exist 20 years ago. As a result, Esan's menu catered to palates more familiar with Buffalo wings and garbage plates than funky fish sauces, salty dried shrimp, and fiery chilies. That early hesitation and caution is still reflected in many of Esan's dishes. The drunken master noodles ($9.50-$12.95, depending upon your protein choice) combine wide rice noodles with bean sprouts, onions, tomatoes, and Thai basil. There's an appealing chew and bounce to the noodles, and the beef and vegetables are all very tender, but there isn't much of a textural contrast. The dish is noted as a spicy item, though my tongue remained untingled. The taste of the pat Thai with shrimp ($9.50) is like an echo of the flavors associated with the dish. Though you can tell what the intent was, what's being received is faded and muted. Again, the rice noodles have a lively, spongy chew, but my shrimp was mealy. Combination Satay (Chicken and Beef Skewers with Peanut Sauce) from Esan Thai. 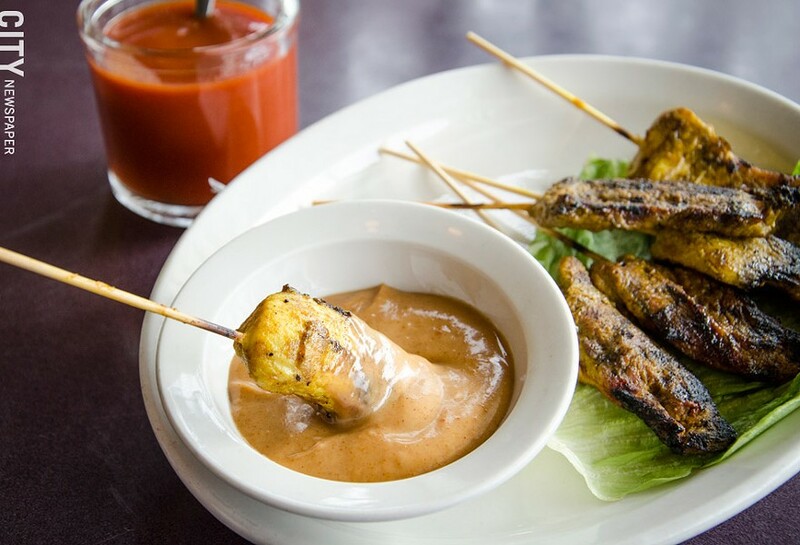 The combination satay platter ($6.75 for three beef and three chicken skewers) is simple and straightforward, with a slightly sweet and unadorned peanut sauce. Iceberg lettuce in the fresh shrimp spring rolls ($3.25) lends a pleasing crisp lightness, and is perked up by the warm licorice flavors inherent in Thai basil. Its accompanying sauce is salty, nutty, and sweet — and tastes pretty good with the beef and chicken satay, too. What I later learned from Douangratdy is that if you want extra hot, herbal, or sour flavors, you need to ask for them. Esan will spice up your dish on a scale of one ("little hot") to six stars ("nuclear"). Chili heads can go beyond the nuclear option and ask for "Thai hot." A concern about seafood allergies means that dried shrimp, a staple in many Thai dishes, are generally omitted — so ask for those too, and for extra vegetables and herbs. You can further customize your dish with condiments on the table — fish sauce with chilies and a chili garlic sauce — but your best bet is to tell your server what you're looking for. Armed with this knowledge, I'd like to give the drunken master noodles and pat Thai another try, and see if the Hell beef will trick me into thinking it came from Hell's Kitchen. Som Tom (Spicy Papaya Salad) from Esan Thai. The som tom ($6.50) ordered with three-stars spiciness ("very hot") provides an addictive make-your-nose-run, reach-for-the-water-glass kind of heat. 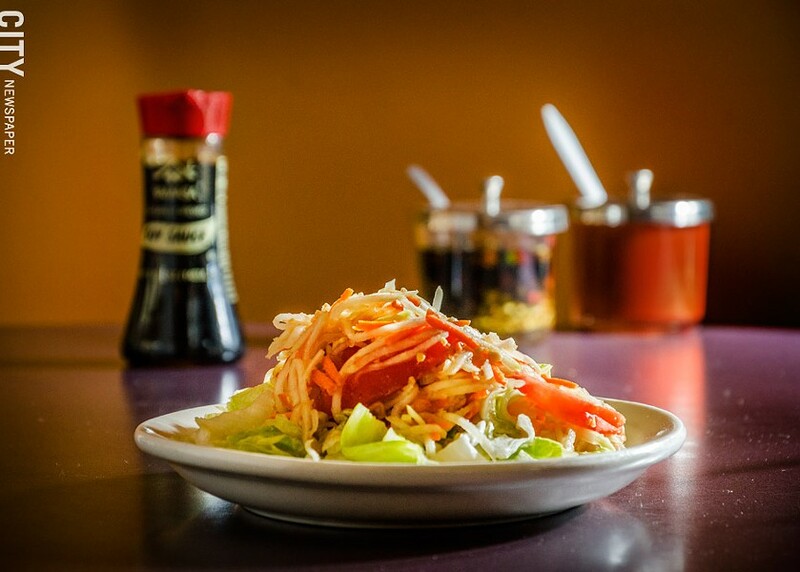 Contrasting the cool crunch of finely julienned green papaya, the salad is the perfect appetizer, whetting the appetite for the rest of the meal. The beef prigkhin ($9.50), ordered with six stars of spiciness, is that much more fiery. The beef is tender — this is a strength at Esan — the green beans are snappy, and the ginger provides a nice zing. 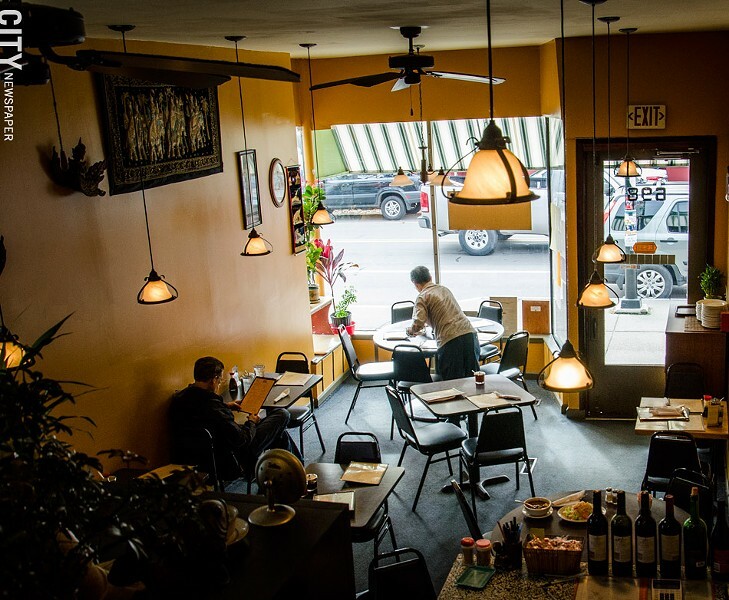 Not many eateries can endure for nearly two decades. Both Douangratdy and Esan's patrons should be commended for running and backing a restaurant long enough to become an institution. That kind of fortitude and support is scare in NYC, and I'm thankful for a Rochester food scene where it's prevalent. Monday-Thursday 11:15 a.m.-9:30 p.m.; Friday-Saturday 11:15 a.m.-10:30 p.m.